The newest office building in downtown Sofia was opened today with a special ceremony. Glavbolgarstroy completed the construction of the second phase of Polygraphia Office Center for a little more than a year. It is part of AG Capital’s original design, which was postponed due to the crisis. The additional areas are built as an entirely new building, replacing the already demolished old one. The total built-up area is 12.6 thousand sq.m, ten thousand of which are rentable. The building has six floors, most of which with an area of 1900 sq.m. The new building is connected to the existing one by a connecting corridor, and offers an opportunity for building a second connection on request by the future tenants. The complex has a parking on two levels with a total of 100 parking spaces. 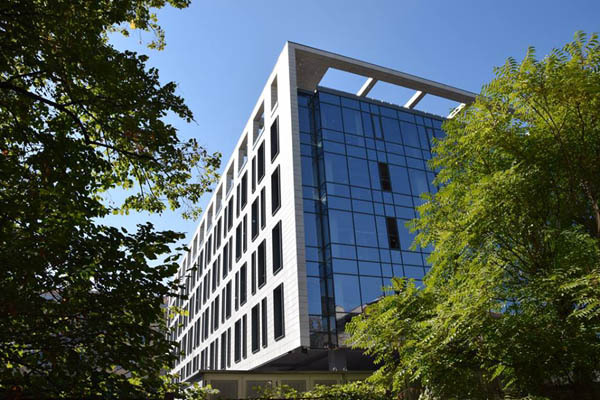 The building achieved LEED Silver certification.